Welcome to the first week of the Holiday Open House! I am so glad you came by to take a glimpse inside my home to view my Christmas Decorations and I really hope that you will join in the fun and link up your own decorations below. 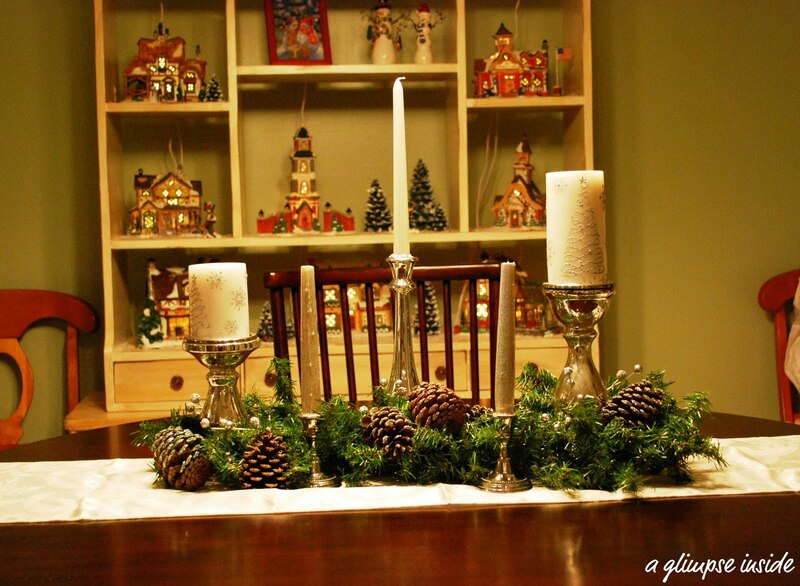 Share your "Kitchen and Dining room" decor at this party. The party will run from Dec. 1st through Dec. 4th. 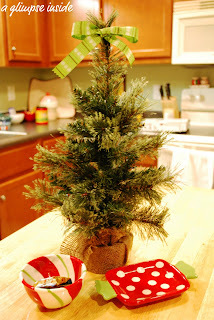 On top of our island, I place this mini tree that I bought at Target last year. I then placed to small candy dishes under it kinda like presents. This isn't what I had planned for the island but my time was running short so this is it for now. If I change it, I will be sure to show you all an updated picture! 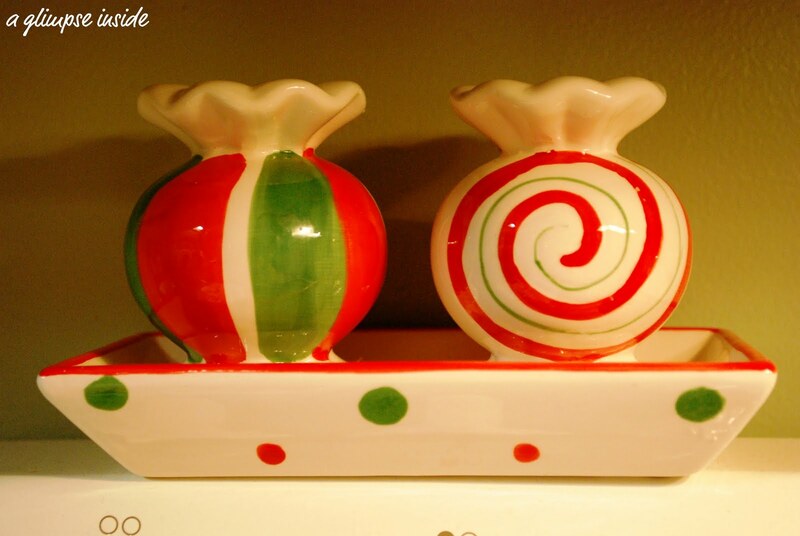 Here are my cute little salt and pepper shakers that I bought at Kirklands last year. 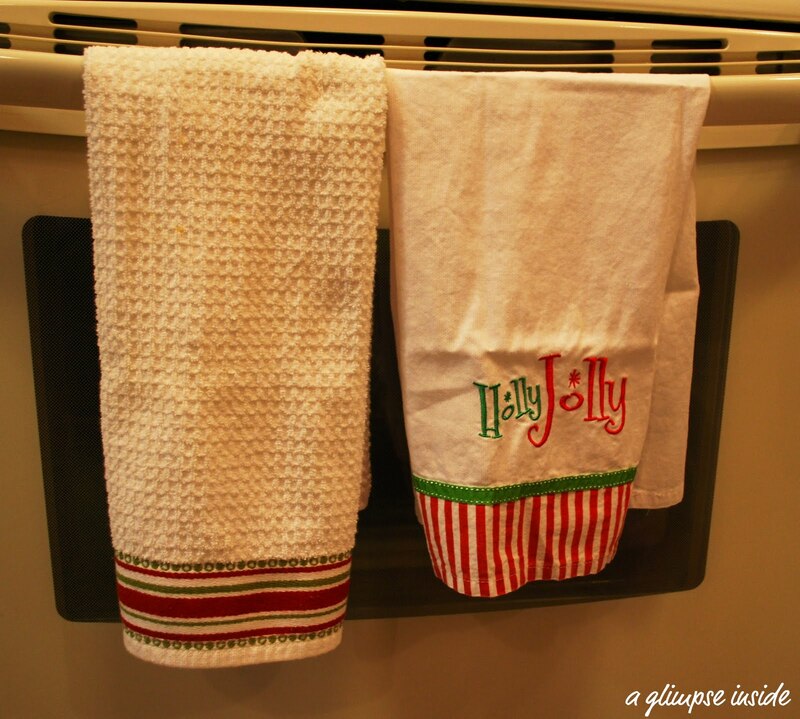 Of course, you have to have holiday towel in the kitchen. I got the one on the right at Cracker Barrel restaurant last year. On my table, I laid a table runner then different silver candlesticks. 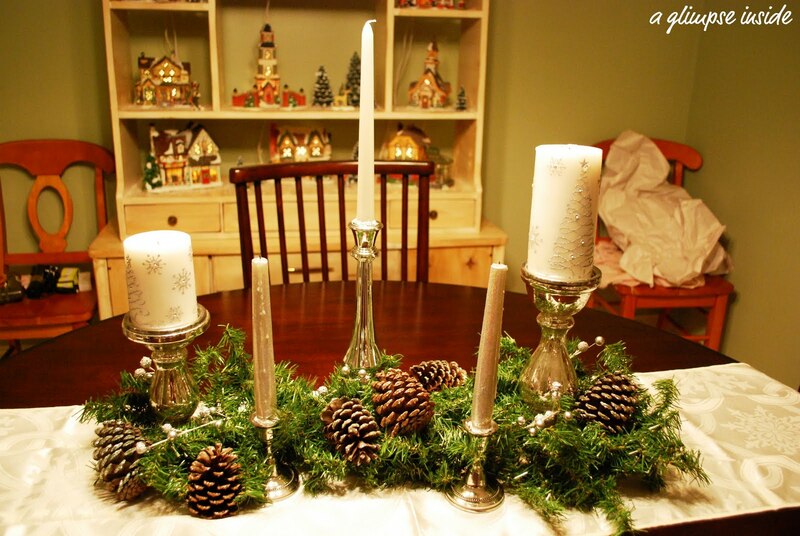 The greenery is some old garland that I wasn't using anymore and I just coiled it up and placed the candlesticks in and around it. Also, placed some pine cones and some berries on it for more decorations. Here is a little closer shot. It kinda looks like something in the Pottery Barn catalog I've seen. Up close shot of the pine cones. 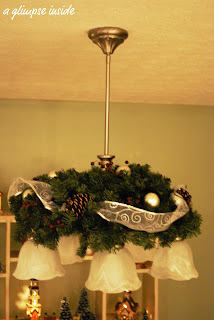 On top of our light I added two decorated wreaths. It worked great at our old house and it isn't bad on this fixture either. We just cut the metal part of the wreaths so they separate and can go on the lamp. 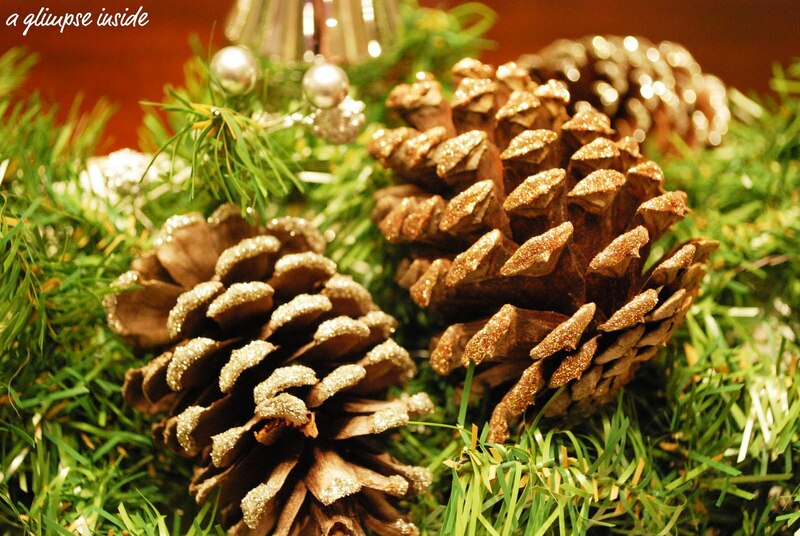 They are decorated with more glitter pine cones, berries, white ornaments, and ribbon. 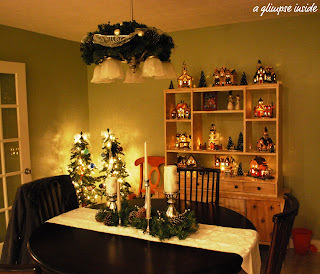 Here's a shot into the dining area so you can see all the decorations. In one corner I have these two little trees. 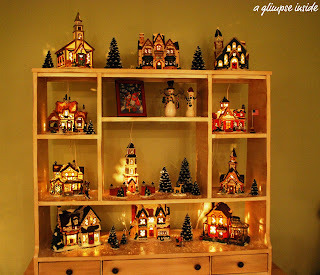 And last stop is my hutch where I have my Christmas Village on display. This is the only place in the house that I can display this but this hutch is just perfect for it. I love the glow it gives off at night! Well that's my kitchen and dining room tour! I can't wait to see yours. I'm sure you all are full of fabulous ideas! 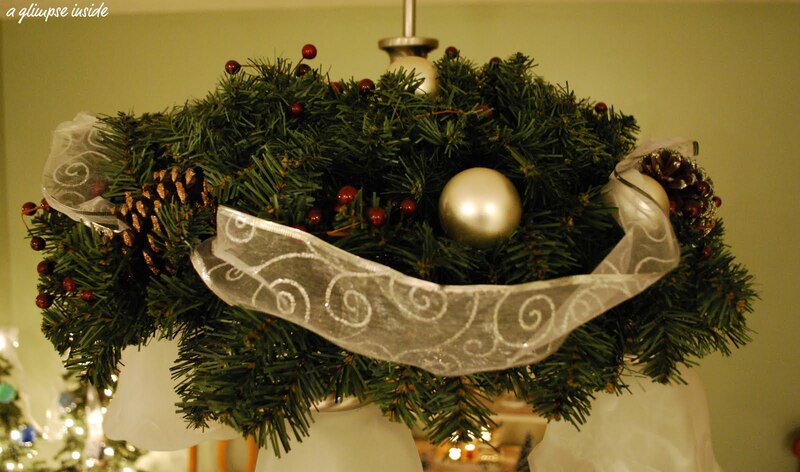 And don't forget, next week, December 8th is Living Room Decor! I am changing things up a bit than what was scheduled- next week you will also link up your other room such as your bonus room, children bedrooms, bathrooms, etc. I'm linking up to some of these parties. Also, Linda's Open House at Coastal Charm. Link up your tour below! Oh I really wish I has decorations to share! Maybe next week...? Between coming back to my classroom after break, to having a formal observation, grad. class, and the craft fair coming up on Saturday...NO TIME for Christmas decorations!! Very sweet Allison. 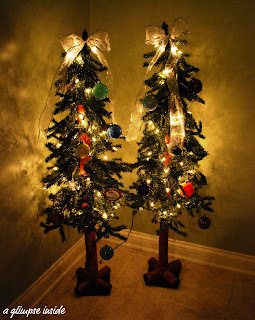 I love how you did the chande too...you have some pretty Christmas decor. 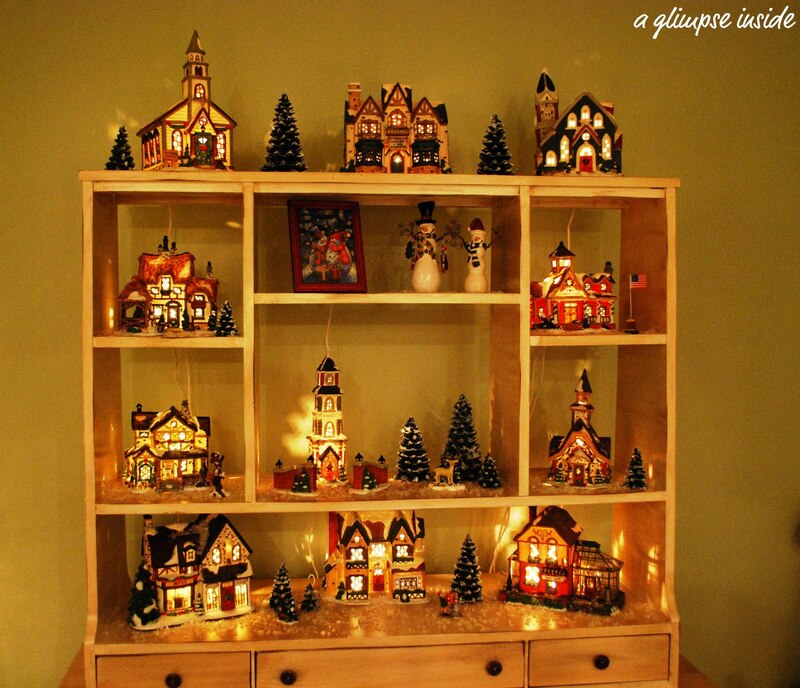 It looks wonderful, Allison! I wish I was able to make decorating the whole house work this year. With our school schedule and travel plans, I was only able to get stockings and the tree up :( I guess that is better than nothing. ooh, I SO love the chandelier greenery, what a great idea! Thanks for hosting a whole other party! It looks so great Allison. I haven't done these rooms yet but hopefully will be done with everything in time to link up to next week's category!